World Trade Center (WTC) is one of the biggest business complex in Russia providing a wide range of business services at the level of world standards. A purpose-built world - class venue, is considered to be the most advanced, professionally equipped and complete convention site in Russia. Clearly designed as international congress & conference venue, it can also be adapted for any kind of meeting due to its versatility: large scale functions, product launches, shows, business meetings, spectaculars, exclusive exhibitions, banquets, promotional activities and special events. 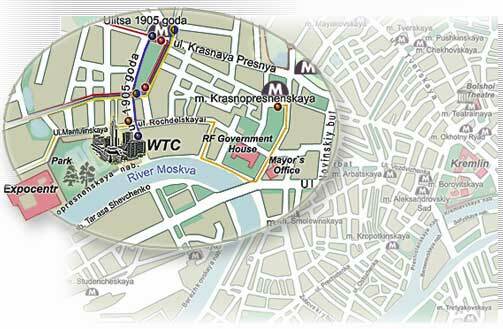 WTC is situated in the downtown of Moscow, not far from the 3rd Traffic Ring, near the Fairgrounds "Expocentre" and the business complex "Moscow-City". The nearest metro station is "Ulitsa 1905 goda"
The event will be held in CONGRESS CENTER (entrance 4) FLOOR 1-2.